Remember the slightly grouchy blog post I wrote last year about how hard it is for lightweight female skiers to find really quality gear? (Ignoring the fact that Ingrid Backstrom is exactly my height and weight, and skis on 182 Katanas; I’ll never be that good.) Well, this is the season that seems set to prove me wrong. Finally we’re seeing a really good range of gear in shorter lengths, both from the big guns like Salomon and K2 and the boutique ski makers like Praxis and Prior. In spite of my natural inclination to support the independent manufacturers, from the moment I saw the specs on paper I haven’t been able to take my eyes off the Salomon Rocker 2 108. It was literally as though Salomon saw every element of my dream ski – length, rocker profile, sidecut, flex – and turned around and made it. Even the graphics are awesome, and I very rarely say that about any ski. So a couple of weeks ago I rode as hard as I could up the Sea to Sky on my bike, and a beer and a couple of pulled pork sandwiches later I found myself with a bit of time to spare in the village while I waited for my ride home. I meandered up to the Salomon store and enquired about when the Rocker 2 108 might be in stock to inspect. It turned out they had one display set in the store. The minute I got them in my hands a white mist descended and I found myself committing to buy them with a set of Guardian bindings. I had nothing on me but a bike tool and spare tube, so they put them on one side until my wallet arrived with J. When J arrived with our driver friend R and my truck, I broke the news that a sixth pair of skis were on their way home with us. To give her credit, she didn’t blink – even when it turned out she’d left my wallet in Vancouver and was going to have to pay for the skis herself. And after the misery of this past summer, somehow the Rocker 2s have made everything better. I look at them and I smile. I read the reviews and I smile. I’m very certain that this is the ski I’ve been waiting for, the one that won’t require any kind of compromise, the one that will make this the best winter ever. I’ve never been this sure about any piece of equipment before. And all I have to do is make sure I’m in the best shape I’ve ever been in to make the most of them. That’s going to take some commitment and work, given the current state of things. This entry was posted in Gear on September 26, 2012 by Kay. I’ve been thinking a lot lately about my ideal ski. I feel like I’ve finally skied enough and demoed enough different planks to be getting a sense of what this might look like. As a lightweight female skier (5’4″ and 120lbs) who sometimes skis really well and sometimes badly, and likes to be on all kinds of terrain, it’s surprisingly hard to find the perfect ski. What I want is something that enables me to charge hard, but has enough forgiveness to accommodate the gaps in my own technique and the learning I still have to do. I want something wide enough for soft snow – my preferred skiing habitat – but that’s also fun on the groomers, because there are days when all I want is to go hard and fast. I want something that’s the right length and flex for my size and weight, which just aren’t substantial enough to be as much of a driver as I’d really like. Basically what I’m looking for is a ski that’s no longer than the Shoguns (164) with a medium flex to accommodate both the fact that I’m not yet as good a skier as I’d like to be, and how light I am. It needs to have full tip and tail rocker because I love the difference that rocker makes on choppy terrain, and a touch of camber underfoot to give it edge hold on harder snow. I’d like it to have a waist at least the size of the Praxis (105); maybe even a touch wider for float in powder. I want it light for touring, with an AT binding. I know enough to be able to see this ski in my mind’s eye, and feel it underfoot in my dreams. What I haven’t been able to do is find it. Either the flex is a little too stiff, or the ski itself a little too long. Like Goldilocks, nothing is ever quite right. 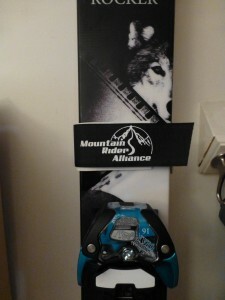 I’m shortlisting skis to demo in 2012/13. I’m super excited by the expansion of the Salomon Rocker 2 family, and the Rocker 2 108 and Rockette 115 are at the top of my list. The Rocker 2 108 actually looks like the ski I’ve been describing made real; the only concern I have is that I don’t know what lengths it’s going to be available in. The Armada VJJ and the Praxis Mountain Jib are definite contenders. I’m also kicking around the idea of a full custom Ski Logik ski; I think I can describe what I want well enough to make the most of this particular option, and it might be the best way of getting exactly what I need. The only questionmark over this idea is the cost; I think I might be better served waiting a season or two, when I’ll have learned to be a better backcountry skier than I am right now. Regardless of how this turns out, I’m having so much fun exploring the options right now. I’m really starting to understand how my skis work as tools, the way my own technique affects them, and the very slight variances that can make all the difference between help and hindrance. I also think I need to book a lesson. It’s been 21 years since the last one; it’s time. This entry was posted in Gear on February 26, 2012 by Kay. Before I go any further, I have to admit it’s taken a ridiculously long time for me to have skied them enough to feel able to post any kind of meaningful review. I bought them a full year ago when I was still mired in the depths of ACL rehab, and seeing them leaning against the wall – so pristine and shiny compared to my other well-worn skis – was a great motivator during some of the darker days of recovery. 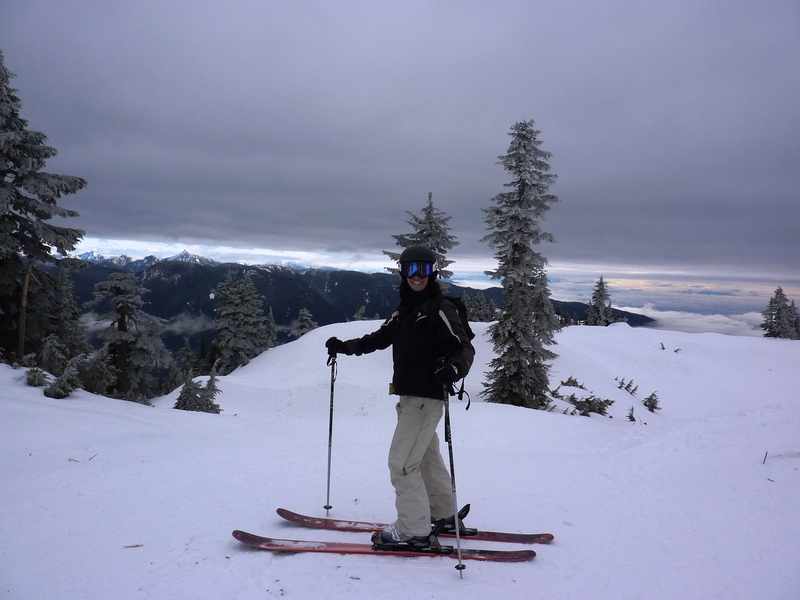 I did take them out once on some very sloppy cement on Mount Seymour last season, but I was lucky to be skiing at all and I certainly wasn’t ready for the backcountry at that point. My first two days touring this year were on bomber ice, which is (to say the least) not their natural habitat. But I’ve finally had a couple of untracked days on them, and that has made a world of difference. Praxis Backcountry: 131-106-121 at 170cm. Turn radius 20m. 45cm of tip splay and 20cm of tail splay, with 5mm of camber underfoot. Mounted right on centre at Keith’s recommendation. Me: 5’4″, 120lbs, still slightly lopsided (right leg is about 10% stronger than left.) Rediscovering my off-piste technique after being restricted to groomers in the aftermath of the ACL surgery. Even mounted with relatively burly Marker Barons these skis are super light. They’re way lighter than my Shoguns; possibly even lighter than the Silencers, which have a fraction of the surface area. They’re robust – the flex feels extremely solid – but not overwhelming for someone my weight, which is a problem I’ve encountered with a lot of the skis that I’ve demoed. I didn’t have any issues bootpacking them 2.5km uphill on the start of our Diamond Head trek. For skinning up, they’re just fine. They’re my first touring ski, so I don’t have anything to compare them to, but the light weight makes them very easy to move uphill. They’re the longest ski I’ve ever been on (I generally ski at 160 – 165), but with the tip and tail rocker they don’t feel it. Turn initiation is impressively easy and on solid snow, that touch of traditional camber underfoot makes them surprisingly easy to tip up on edge and they grip well right through the turn. They feel like they have quite a bit more tail than I’m used to; I haven’t figured out yet if that’s because of the extra length or the stiffer flex. The tails did feel a tad hooky on the groomers that I skied initially, but that may just have been unfamiliarity and conditions that weren’t ideally suited to the ski. In powder, these skis came into their own. Even though it was somewhat wet, the tips rose up the second I started moving and never dipped. The skis lifted off bumps and absorbed air and landings like it was all part of one endless floating line. In the choppy snow we encountered around Disease Ridge, the rockered tips smoothed out the ride and took it all in stride. My only complaint about the skis is that the topsheet construction isn’t great. They already have a number of sizeable gouges, and even light contact between the edges causes chips and scrapes. That’s not really a big deal, however. After five days, I’m excited to get to know these skis better. I want to take them out in every conceivable kind of condition, from perfect corduroy to spring corn to broken crud. I think the BCs have the potential to make me a better skier, and I certainly feel like I couldn’t have made a better choice for my first touring ski. I’m jonesing like crazy to get out there on them again. 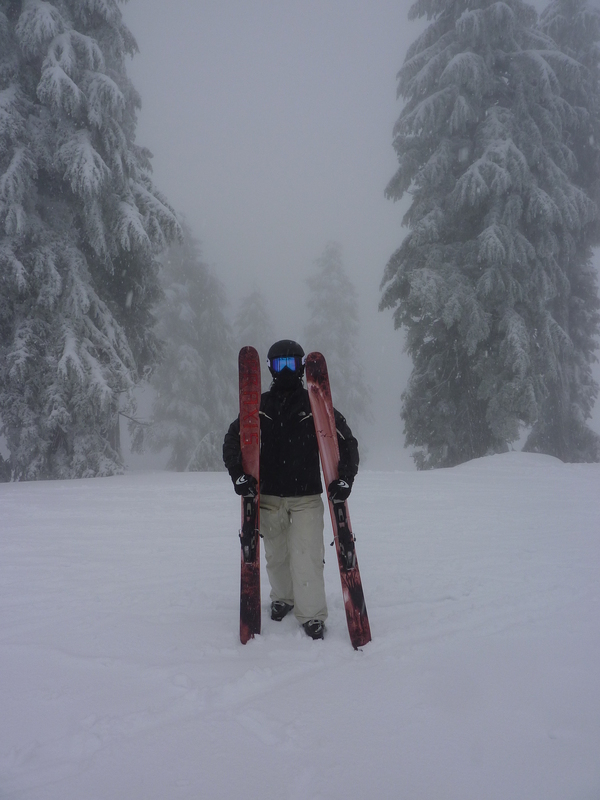 Update 24/2/12: On Monday I took the Praxis out for a couple of hours at Blackcomb. It was very cold and super icy, which made for interesting testing conditions. I learned a few important lessons along the way. Icy groomers are not this ski’s preferred surface. On the scoured boilerplate, it was really hard work trying to get them to hold an edge and I ended up doing a lot of skidding around. The second I got them into softer snow, little bumps, or even just away from the ice they were much happier. I need to stay on my game. The longer ski and stiffer flex in the tail means that these don’t let me get away with slips into the backseat. On firm snow and in crud I could feel the tips heading away from me each time my weight drifted even slightly back. This is probably a very good thing, since this is a habit I really need to break. The tip rocker rocks, the ski loves to be in the air, and speed is its friend. When the skis were pointed downhill, I flew over everything in my path. They’re so light that they just leap off bumps and rollers. And once I let them start running at speed they were easy to carve, held their edge awesomely, and felt very stable. In short, this is definitely more ski than I’m used to and I need to stay alert and on my toes when I’m on them. The more aggressively I ski them the more fun they are, especially in softer snow. I’m not sure they’d ever be my first choice for a groomer day, but a powder day inbounds? Absolutely. This entry was posted in Gear on January 13, 2012 by Kay. After a long battle, I finally admitted defeat with my road bike. I was determined to make it work, partly because I love the bike and partly because I really couldn’t afford to replace it. But even with the assistance of one kickass physiotherapist and three kickass bike fitters, I couldn’t fix the basic underlying issue that the frame was too big for me. We managed to dial in the fit enough that the crippling nerve pain in my shoulder kicked in at 70km rather than 20km, but now that I’m doing at least two rides a week at that length it wasn’t good enough. So I resigned myself to selling the current road bike, and replacing it with something very similar but in a smaller size. The new bike would have to be funded primarily by the sale of the old bike, so I didn’t have a lot of scope for upgrades. I did know for sure that I wanted another Rocky Mountain, as I love their bikes and I really like that they’re a local company. With budget limitations in mind, I started scouring the internet for the best possible deal. I’d heard rumours of fire sales on 2011 models in the States, and was really hoping that I might be able to find something too good to be true. It took a couple of months, but it happened. I found a full carbon frame Rocky Mountain – the same model I’d asked my local bike shop about, then sadly put out of my mind when I heard the price – for a steal from a store in California. So I bought the bike, only to discover that the store wouldn’t ship to a Canadian address (even though Rocky Mountain is a BC-based company.) I wasn’t willing to let go of the deal, so I ended up shipping it to a package receiving store in Sumas, Washington. The fates aligned and I was able to catch a ride down to the States with a friend this weekend; I liked the idea of riding it home so much more than just plunking it in the back of my truck and driving it back to Canada. 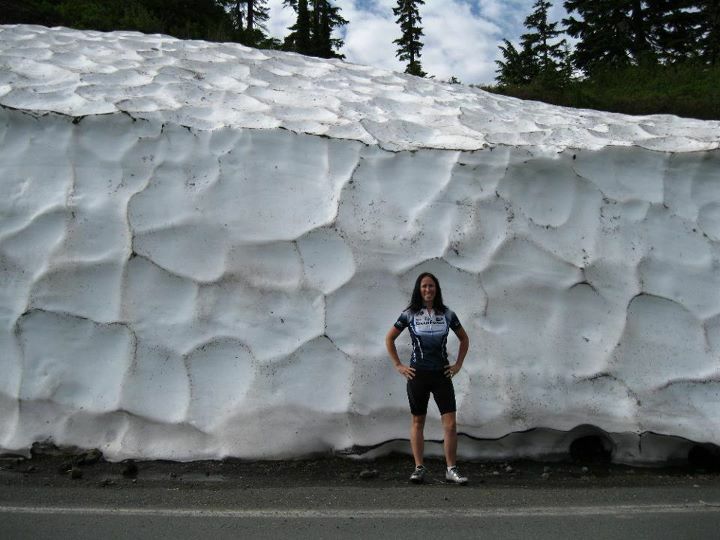 We met up at 6am to beat the border lineups, and had time to go admire the snow and rock on Mount Baker before picking up the bike. At the package receiving store, the first flaw in the plan emerged. In spite of the fact that the store made a big deal out of including a free bike build with any purchase, the box contained not a fully assembled bike but a beautiful carbon frame and a big pile of parts and components. An hour and a half later, I had a new appreciation for the versatility of a bike tool (and my friend R, who selflessly sacrificed her time to hold pieces in place while I bolted them together) and a reasonably secure-looking bike. I took it out to ride around the block a couple of times; I wanted to be sure nothing would fall off before I set out on the long ride home. Kicking off was an eyeopener. It was like opening the gate for a racehorse waiting to charge, or a plane hitting takeoff speed; the bike is so light that it just wants to fly when you start moving. I was absolutely blown away; I had no idea cycling could feel like that. By this time the clouds had closed in, rain was falling, and an ominous grey sky promised that things were only going to get worse. R tried hard to convince me that I should get a ride with her at least to Blaine, but I was too stubborn and too excited about the bike to think it through and waved her cheerfully away as I set out into the monsoon. Within 40 minutes, the rain had intensified to a point where I couldn’t see more than a hundred yards in any direction and my waterproofs had given up the ghost. 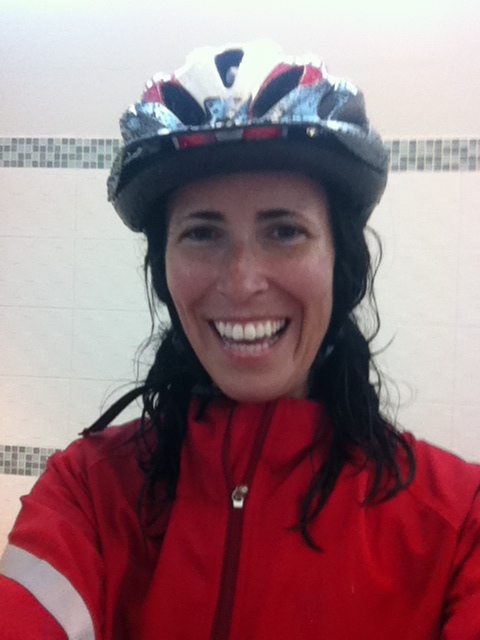 Water squelched out of my shoes with every turn of the pedals, poured down my back and out of my sleeves, and ran in a steady streaming torrent off my chin. My passport and iPhone were safe in a ziplock baggie in my backpack, but I didn’t dare take them out for fear the phone would instantly drown. With no access to Google Maps, I ended up figuring out my way to Blaine through trial, error and instinct. Fortunately the route was pretty direct, as I’m not known for having a stellar sense of direction. 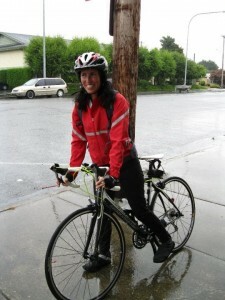 The long stretch through rural Washington in the downpour was one of the more surreal rides of my life. I had absolutely no sense of where I was in the landscape, because I couldn’t see it. With a new bike under me, nothing on me but a handful of documentation, bike tool, phone and a couple of protein bars and the border approaching, I was very conscious of being in another country. The rain didn’t bother me enormously – it was wet, but not cold – and yet because it took away the scenery, it gave the ride a deeply eerie feel and made it seem a lot longer than it actually was. When I finally hit Blaine, it came as a complete surprise: a scatter of houses emerging out of the grey and misty landscape, and then a surge of Canada-bound traffic. I followed the signs to the border, where the stop at customs was surprisingly straightforward. For some reason I’d assumed that a drenched cyclist with a brand-new bike and no baggage would be a problem. Because I’d been so focused on the border crossing, what I’d forgotten was that I was only about a third of the way through the ride at this point, and that from here on in it was all hard going on the shoulder of busy highways. I got badly lost at both ends of the Alex Fraser Bridge, ending up on a golf course on the approach and at the wrong end of Annacis Island at the exit. As I turned off the New West Highway onto No. 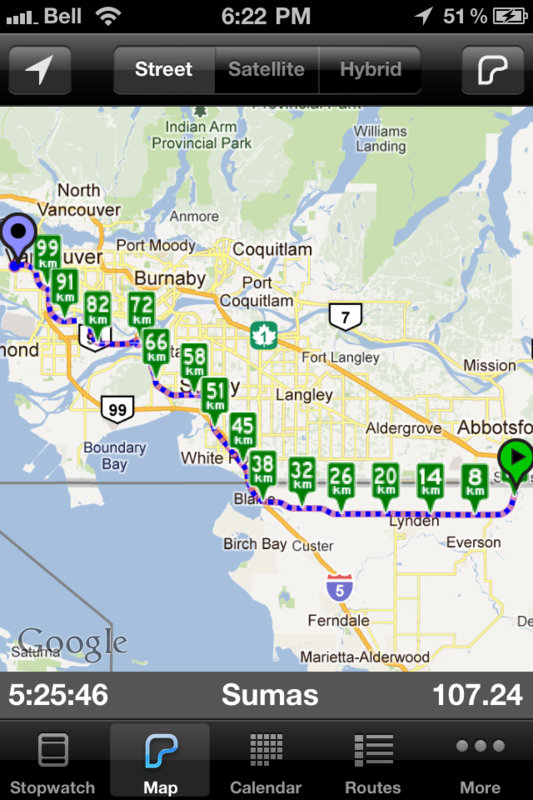 7 road, the rain finally eased off and I was even able to shed the waterproofs on my way back into Vancouver. It wasn’t the most fun ride I’ve ever done, and yet it was. 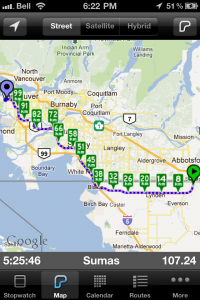 I hacked the bike together in 90 minutes in the back room of a shipping company, but I didn’t have a single twinge from the problematic shoulder in 107km from Sumas back home. I rode for more than 5 hours in an epic downpour, and yet never once did I seriously consider putting the bike on the Skytrain or in a cab. The whole point of the adventure was to ride it home. Every second I’ve spent on this bike so far has justified all of these ridiculous decisions. It’s so light; it wants to fly in a way that no other bike I’ve ever ridden has. It corners like it’s on rails; it wants to dip and lean into every curve. I can ride it without pain or discomfort, even though I haven’t dialed the fit in at all. 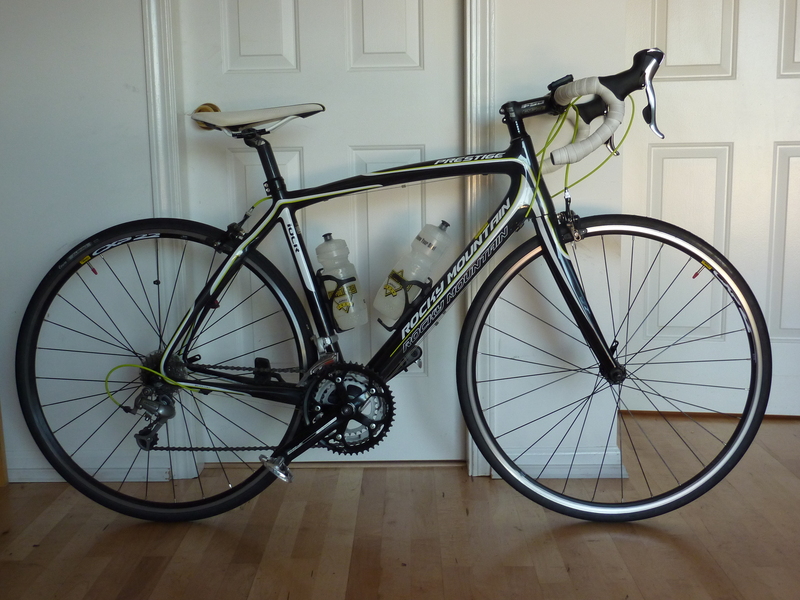 I cannot wait to ride the Whistler GranFondo on this machine. It’s going to be a whole different experience. And you know, I could have just gone to a bike shop and bought a bike the way a normal person does. But where would the fun have been in that? This entry was posted in Biking, Gear on August 23, 2011 by Kay. For the past two years, I’ve been slowly building my quiver. It started with the addition of K2 Silencers, which are still a tremendously fun and forgiving ski that can be used to bomb all over the mountain. Last season I added the Shoguns, which will become my everyday driver once I’m back up to full strength. I’d still like to add in a pair of Priors because I had such a great time demoing them last season, and Ski Logik simply because their Tiger topsheet is the best ski artwork I’ve ever seen. 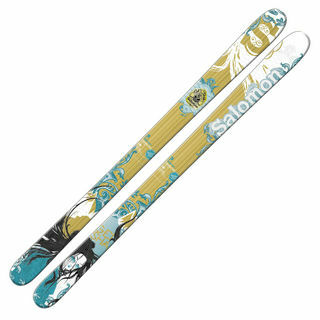 But the whole time, since I started researching skis, I’ve been dreaming about these. I first learned about Praxis via one of the ski forums I visit, and the Backcountry immediately jumped out at me. It’s been one of my biggest skiing goals to get a full AT setup together and start earning my turns, even back when I was still in the UK and skiing once every few years. The description sounded an exact match for what I was looking for in an AT ski; lots of rocker, low camber, light enough for touring but burly enough to rip through any and every snow condition. I also loved the waterfall graphic, which was a complete departure from the current trend for garish cartoony graphics. Much though I loved them, however, they weren’t first on the list to add to the quiver because I needed to build my skills in-bounds before I even considered heading out into the backcountry. The knee injury was another huge setback, and I tried to put all thought of AT equipment out of my head. Nonetheless, I’d find myself wandering back to the Praxis website or checking the TGR forums for reviews of the Backcountry, even though I didn’t think I was in any position to purchase them. I was actually kind of disappointed when Praxis released the 2011 lineup, because the skis no longer featured the 2010 waterfall graphic that had become embedded in my subconscious as an intrinsic part of this ski. And then one evening when I was still largely immobile after knee surgery I sent an email enquiring about whether the waterfall graphic would be available in the future. A brief conversation with Praxis owner Keith O’Meara later and I had a unique pair of 2011 Backcountries on order, with the original waterfall topsheet. I told Keith not to rush the production if they were busy, given that I wouldn’t be skiing for a while yet. With production not scheduled until December, they were ever-present in the back of my mind but also seemed a little too far away to be real. They came out of production a couple of weeks ago, and arrived on Christmas Eve – possibly the best Christmas gift of all time. I’d picked up a pair of Marker Barons dirt cheap in the off-season sales, and took them in for mounting as soon as the stores were open. I can’t ski ’em yet – and may not even be able to this season – but every single time I look at them, I smile. This entry was posted in Gear on December 31, 2010 by Kay. Turned out that cycling 100k was exactly what my leg needed. The bike ride kickstarted my poor atrophied quad muscle into firing again, and for the past week I’ve been pushing it through massive amounts of leg presses and squats every day. It’s still noticeably smaller than the other leg, but the muscle has definition again and slowly, slowly the strength is coming back. Tonight I saw the physio and he said that this is the fastest he’s ever seen anyone return to activity after a complete ACL tear, and that I’d made great progress in 7 weeks. I had to tell him it’s only been 5 weeks. Knowing me, I’ll now fall over while doing something completely innocuous (hanging laundry, perhaps) and blow out the other knee. I had a small wrangle with the medical system last week after finding out that the OS I was originally referred to for knee surgery had an 18-24 month wait list just for the initial consult. Two days of phone calls and a bit of lateral thinking eventually ended in an appointment for May 19th with the OS I saw for my last knee injury four years ago. Given the wait I could be facing, I’m incredibly grateful for this. It puts me on track for surgery in the late fall, which will write off the 2010/11 ski season. Unfortunately, I don’t think there’s anything I can do about that. For the fitting they put me in a full leg cast, which then had to be sawn off. Perhaps surprisingly given my history of injuries, that’s actually the first time in my life that I’ve ever been in a plaster cast. 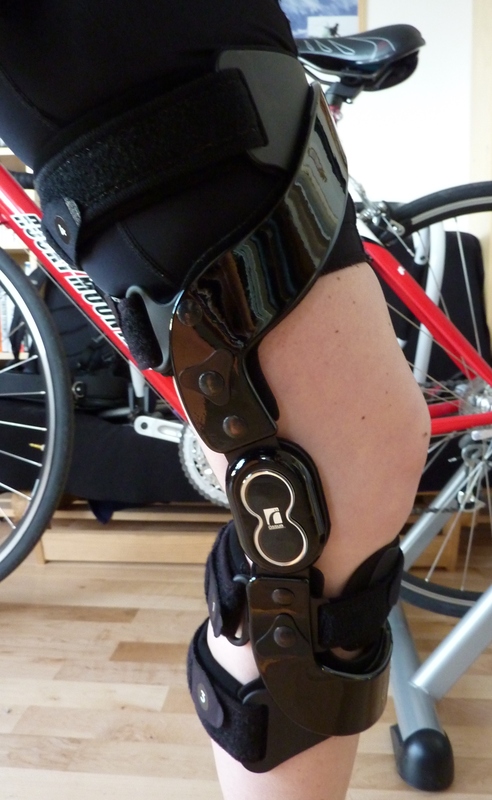 The brace itself is impressively lightweight, and very comfortable. The folks at Ossur were awesome, and I would highly recommend them to anyone needing a custom ACL brace. So I’m back to cycling long distances again, and swimming, and doing all the things I need to be doing in the gym. The knee is mostly pain free now, the swelling is considerably reduced, and it’s bending to within about 10-15 degrees of the other leg. One step at a time, I’m working my way toward whatever normal is going to be for the next few months. This entry was posted in Gear, Injuries on April 13, 2010 by Kay. Friday was one of the most mixed-up days I’ve spent on the mountain. I left Vancouver at 5.45am in torrential rain, and drove to Whistler through some of the ugliest conditions I’ve ever seen on the Sea to Sky. I pulled into Function Junction in driving sleet just before 8am, only to find that the Prior Factory was more-or-less closed for a powder day. Fortunately a generous snowboard tech hooked me up with the Doughboys I’d booked, even though he couldn’t mount my boots. Since my boots came from the Salomon store in Whistler, I stopped by to see if they could mount them on my way to the gondola. A kind tech offered to help, then found my boots were too short for the bindings on the skis I’d been given. (This made sense later, when I learned that the tech had accidentally given me a customer’s skis instead of the demo pair.) When he realised how unlucky I’d been, he offered to give me a pair of Salomon rentals free of charge – and promised that he’d hook me up with a pair of skis that would make up for the inconvenience. So I ended up in the gondola lineup just after 8.30am, with an unexpected pair of Salomon Geishas propped on my shoulder. Unfortunately, I hit the lineup just moments after they’d announced that Whistler wasn’t going to open due to avalanche danger and the entire Whistler line joined the Excalibur line, which was already back past Zog’s. An hour later, soaking wet from the somewhat soggy village level snow, I was swearing viciously and had decided that if I wasn’t on the gondola by 10am I’d cut my losses and head back to Vancouver. At 9.55am I finally got in a gondola cab, and arrived on the mountain while it was still covered in inches of beautiful powder. I clicked into the Geishas, and discovered the joys of rocker on a day that couldn’t have been more suited to it. One of my biggest snow issues has been that I can’t cope with deep, soft stuff, especially when it gets chopped up and heavy. My Silencers sink like a stone, and the tips take wild deflections when they’re not getting caught up or bogged down. With the Geisha’s rockered tips and almost unbelievably smooth bases I just blasted over everything, floating over the powder and slicing and dicing the piled chop toward the end of the day. The first couple of runs are ones I’ll remember for the rest of my life: three-dimensional skiing on barely-broken powder snow, on skis that changed my ability to deal with the picture completely. At the end of the day the snow finally stopped falling and the sun came out, lighting up the runs for the ski-out to the village. Overall, given the initial difficulties getting on the mountain and the fact that only three lifts were open, I had a great day. I spent a lot of time in lineups, and probably less time on snow than I ever have on a full day pass. But the runs I got made the lineup and the rain and all the hassle more than worth it. And I’m totally sold on rocker now, especially as the balance of my skiing shifts more and more toward off-piste. I’m still not 100% certain what my next ski will be, but I am sure that it’s going to have rocker. 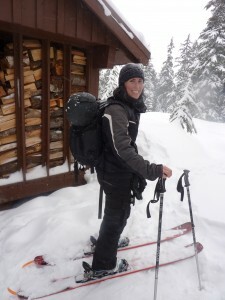 This entry was posted in Gear, Skiing, Whistler Blackcomb on January 17, 2010 by Kay. When I saw snow in the forecast I came very close to booking the Doughboys for another day out at Whistler yesterday, but held off at the last minute because I wasn’t sure I’d get up in time to pick them up and be at the village for first chair. It wound up being the right decision, as an unseasonably warm morning gave way to a brief, soaking rain and persistent drizzle in the afternoon. There’s more heavy rain in the forecast on Monday, which is a shame as I have an extra day off that I was planning to spend on the mountain. In spite of a sluggish start I made it to the Fresh Tracks breakfast, where I hoped a second helping would mean I could ski through lunch. This turned out to be a great plan, saving me the forty minutes or so that lunch normally keeps me from the slopes. I started out with some swift morning laps on Upper Dave Murray and Bear Paw; Dave Murray was groomed to perfection and was an absolute joy to ski before the chairs opened to the hordes waiting down in the village. Bear Paw had been skied into low bumps with an overnight coating of about 5cm of fresh snow, and was a whole lot of fun. A couple of excursions to Harmony Bowl and the cloud-shrouded Whistler Peak were followed by a spell in the terrain park. WB have added a second line of small and medium jumps which are just perfect for the folk like me who are looking to gain confidence in the park. I love the incredible rush of air time, but I’m wary of large jumps and bad landings because of the state of my knees. Hence I’ve approached the terrain park with uncharacteristic caution (as opposed to the reckless enthusiasm with which I launch into most things skiing-related) and am getting a lot of satisfaction out of my current progress. After what would have been my lunch break had I not been stuffed full of Fresh Tracks bacon and sausages, I headed back up to the peak to work on my carving. Three top-to-bottom laps on Peak to Creek gave me plenty of time to concentrate on technique at speed, and apart from a brief zero visibility stretch at the top the run was in awesome condition. I’m working hard on upper body movement (especially my pole plants, which suffered from the years I spent skiing with poles that were two inches too long) and getting more hip movement into my carving, and was noticing significant improvements in both areas. Spending time on technique at the local mountains before heading out to Whistler to put it into practice is definitely paying off. It was also fun to spend a Whistler day mostly on groomers; although I love the challenge of the off-piste terrain, especially the big bowls, sometimes you just can’t beat pointing your skis down the hill and going for it. Yesterday I also tried out the audio feature of my new helmet for the first time. I honestly couldn’t imagine myself using it – I like to hear what’s going on around me – but I discovered that the balance between the music and allowing external sound in is perfect, and it did give an extra dimension to the skiing experience. That said, perhaps my choice of Arcade Fire’s “Wake Up” for my first run was what led to me spending so much of the day jumping off kickers. Now I just need an iPod that can last all the way up the Sea to Sky and through a day on the mountain. 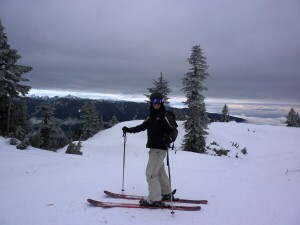 This entry was posted in Gear, Whistler Blackcomb on January 9, 2010 by Kay. Doughboys are Prior’s powder ski. Handcrafted in Whistler, they clock in at 138/103/116 with a turn radius of 16m at 159. The pair I took out today came off the production line earlier this week, and had never been ridden before. First off, I have to admit I didn’t pick the best day to demo a powder ski. It was brutally cold, with an absolute bomber of a snowpack: icy, crusty and wind-scoured, even in the alpine. Temperatures were hovering around -10 before the chill factor from a howling wind that tore sheets of spindrift from every exposed face. My knees have been extra cranky this week, and weren’t too happy about being hauled out on the slopes for the day. Fortunately, the Doughboys put all of these things in the shade. First impressions: holy smokes, these puppies are fat! At 103mm in the waist they’re easily the widest skis I’ve ever been on, with a great big shovel of a tip leading the way. With the big footplate and a slightly different binding setback than I’m used to, I really had to work to get them on edge until I figured out where the sweet spot was. And once I did, I was amazed: the Doughboys carve on a dime. With substantial sidecut and a really aggressive taper from tip to tail, they’re amazingly nimble for their size. Carving groomers became a series of big, surfy, joyful arcs across the run. In the afternoon when the snowpack was chewed up and rough, the skis just blew across the bumps and ruts like they weren’t even there. Skidding and smearing turns was easy, but the real fun was getting on edge for those big, deep carves. The Doughboys were quick to punish any slip into the backseat, and I discovered that I’ve developed a bad habit of dropping my weight back when I turn to the right (I have an ongoing problem with outside ski dominance on that side because my left knee joint is so badly damaged). The Silencers let me get away with this because it’s only a slight shift and they’re an exceedingly forgiving ski, but with the Doughboys it immediately became pronounced. I suspect the Doughboys would be more forgiving in soft snow; on the groomers I definitely had to stay on top of them and keep aware of my weight distribution and body position. I did find the slightly upturned tail more responsive than the Silencers’ twin tip, especially during transitions. Persistence eventually delivered a few softer runs in Lakeside Bowl and the ever-reliable Secret Chute, along with some crusty powder deep in the trees. The snow wasn’t really good enough for a fair assessment of soft-snow performance, but it did give me a sense of the Doughboys’ potential as the monster of a tip blasted over crud and broken crust without a hint of deflection. The only places the ski didn’t excel were on the ski-out (unsurprising, as large parts of it consisted of golfball-size pieces of ice) and on large, icy moguls, where it took a lot of work to maneuvre them quickly enough. For a powder ski, that’s impressive versatility. The overall verdict? The Doughboys rock. I do need to take them out on a powder day to get a feel for how they perform on the kind of snow they’re made for, and I also want to demo the Husume (Prior’s new rockered backcountry ski). Today was enough to sell me on this: the next ski to join my quiver is definitely going to be a Prior, and most likely a Doughboy. This entry was posted in Gear on December 4, 2009 by Kay.